Some fishermen gathered in Bedeque in central P.E.I. 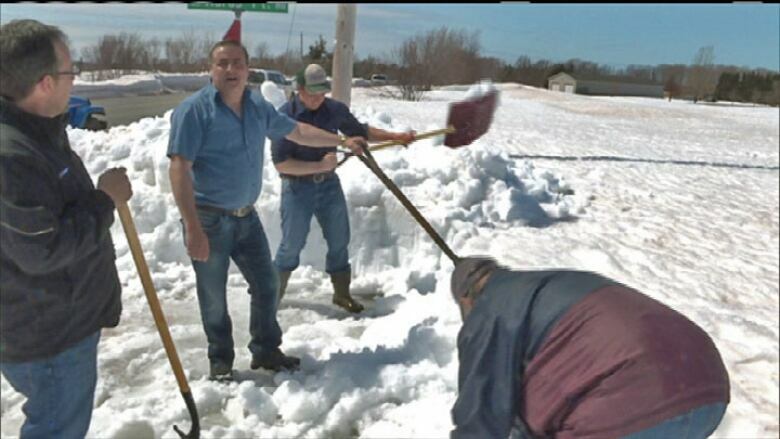 with snow shovels to protest the province's failure to clear roads to the shore. Snow is still piled high in many parts of the province, and it's blocking access to the shore for shell fishermen, whose season starts May 1. In Bedeque there is a trailer park on the shore the fishermen use during the season. Norman Gamble, who has been fishing oysters for 30 years, told CBC News they need access to the shore now to get ready. There are water tests to be done, and the unpaved road needs to be dry enough to get the trucks and trailers to the shore. "[It] takes a while to do all this, need the road to dry at least a little bit," said Gamble. "[We] don't want to wreck our trailers and trucks trying to get our equipment in here before we even start fishing. " The Department of Transportation said crews have been dealing with hard packed snow in areas, and equipment problems. They said they'll try to get the access roads cleared this week. For mobile device users:What do you think of the fishermen's snow shovel protest to get roads to fishing grounds cleared?